Following the Civil War in 1865 and the Emancipation Proclamation on January 1, 1863, there arose the controversial Reconstruction Period which continued until 1877. 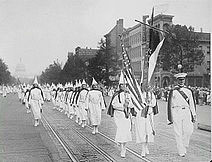 It was during this period of time that the most infamous hate group called the Ku Klux Klan was founded as a social club in a college setting of students in Pulaski, Tennessee, in 1866. The name for this clandestine circle is taken from the Greek word, “Kyklos” meaning circle. The first leader or “grand wizard” of the Klan was a Confederate general named, Nathan Bedford Forrest. He ruled over a hierarchy of followers called the Grand Dragons or Grand Titans and Grand Cyclopes. At its peak in the 1920’s, Klan membership exceeded four million people nationwide. This era coincided with the Reconstruction period following the Civil War and was made up of radical members of the Republican Party in Congress. These were later joined by such groups as “Knights of the White Camelia’s” organized in Louisiana in 1867 and the White Brotherhood. The further development of the Ku Klux Klan came to be identified with other hate groups or White Supremacists such as Skinheads and Neo-Nazi groups formed in the 1950s with aggressive terror activities practiced in the 1960s and 70s, primarily focusing fear tactics into the hearts of victims predominantly members of the Black population and in many instances, included Jews and other foreigners and immigrants. The Most Honorable Elijah Muhammad presented the argument in the 1960s that although he was opposed to the Ku Klux Klan’s terror technics and practices of intimidation and violent acts, he agreed in principle that the two people, Black and White, were not intended to live together in peace, and most certainly, not in interracial mixing or marriages. I was present in the auditorium in Chicago when one of their Klan leaders, J.B. Stoner, the Archleader and Imperial Wizard of the Christian Knights of the Ku Klux Klan addressed these racial issues in the public. 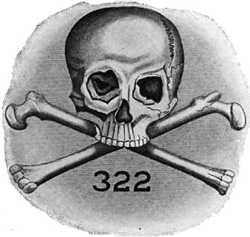 The logo of the Skull and Bones secret society. There’s a pamphlet that was published by the Most Honorable Elijah Muhammad on this event in which we participated. The Ku Klux Klan mentality of White Supremacy has infiltrated every institution and high office of the land and has spread through various magistrates, Departments of Justice and is inclusive in the criminal system of the police departments of the United States. As we have discovered in the Greek fraternities on college campuses and universities, there are sinister practices and initiations that are incorporated in their secret societies rooted in the prevalent rule of the White race as being superior to all others. The Most Honorable Elijah Muhammad informed many of his followers that the infiltration of this violent element of the Ku Klux Klan would be dispersed in the police department regimens, in the leading courts and departments of government in this country. It is this element that is interspersed with the aggressive and violent acts we have witnessed across the nation in the killing of unarmed Black men, children and youth in recent days. It is an unwritten law taken by oath and secret alliances to kill our young and innocent Black men and youth and to spare our women, even as Pharaoh ordered the killing of the men and the sparing of the women in his time. These are the blatant, evil practices that are the order of the day. We will note in the sequencing of the number 11 that the KKK is composed of a combination of three sets of the number 11. K is the eleventh letter of the English alphabet. In our Supreme Wisdom Lessons, Problem Number 11, we are given a study of history corresponding to the dates of the Civil War era, the Emancipation Proclamation and the Reconstruction Period giving birth to a Saviour, Master W. Fard Muhammad in 1877. He made Himself known to us in America in the 1930s with a promise of Freedom, Justice and Equality and a commitment to true Independence. After the Revolution comes the war, after the war comes the peace, and after the peace comes the establishment of God’s Kingdom on earth.